Vocalist Aaron Weiss unpacks the apocalyptic imagery inside mewithoutYou’s newest release Pale Horses, why he likes to explore each album from a different perspective, and how that left him at his most unguarded while trying to reconcile his love/hate relationship with religion. You did a few festivals last month and then you have the headlining tour coming up in a week. What can we expect from that? I saw you’ve been taking some requests on Twitter for the setlist. Oh, I didn’t know that. I’m not sure who was putting that out there, but we’re trying to have as many songs ready as possible so that we can change it up quite a bit. Yeah, it’ll be nice to take requests. There are still some songs if someone requests we would not be able to play, either because we’re so out of practice or don’t really like anymore, but for the most part we still play almost all of our songs if people want to hear them. Last year you did the 10-year run for Catch for Us the Foxes and the rerelease on vinyl. For a lot of people, myself included, that was the first record that introduced us to the band. What was it like revisiting that 10 years later? It was cooler than I would have expected. There was part of me that was a little bit ambivalent about it, because it’s so long ago and we’ve all changed. I don’t know. There’s something unoriginal about it, of course, but at the same time if people wanted to hear that album, I sure didn’t mind playing it. Why not? It was a good time. It was more energetic than a lot of our later songs, so it probably got me in better physical shape because it was tiring. You’ve always had really interesting artwork and Pale Horses is no exception, but it’s in a little bit of a different style than most of your past covers. Can you talk about what went into the design? It was actually pretty difficult to come up with something. We had tried to do something that was more in keeping with the previous albums, but it just felt like nothing was working. Nothing fit. We had a lot of cool options and we wanted to stick with Vasily Kafanov, who did all the artwork for our albums, but we also wanted to do something drastically different. We went through a few iterations and finally we found that style. That actual image from the cover was done in 1978. Unlike the previous albums, he didn’t do an original piece for us for the cover. Once we told him that we liked that one and thought it fit the mood of the album, then we asked him to do some more work in that same style and using some of those same elements, which he did. That work constitutes the layout of the album. Ten Stories was a concept album written about a train crash and told from the perspective of all these different animals, and even the record before that had some of that same folk storytelling on it, while this one is very different in that none of that stuff is included. What was it like to transition between those two things? I like that, being able to change and find new approaches to writing. It keeps it more interesting for me. A lot of my ideas have stayed relatively consistent over the years. I’ve changed personally, I suppose, but sometimes it feels like I’m not saying anything terribly new. It’s a lot of similar stuff that I’ve said on previous albums, but I need to find new ways of expressing it. I do have new experiences that change my perspective, but I think having a more fundamental shift in the style of writing can create an overall mood or a feeling for an album. To me, that’s what I’ve tried to change with each album, at least with the past four albums. I can say every time there was a more or less deliberate stylistic adjustment, or even in some respects it was going back to an old style of writing. That to me was still an adjustment, still a way of revisiting a familiar voice but with all my life experiences that have changed me. I think in that way it keeps us from becoming too formulaic, but also I want to avoid just trying to change for the sake of change and chasing after one novelty after another. I’d like there to be something familiar about what we do as a band and not totally reinvent ourselves with every release. You’ve described this record as being at your most unguarded and unfiltered, which I thought was interesting because I’ve always thought you to be very open and unafraid to say whatever was on your mind on past records. What about this one made it different for you then? Well, I think there are more critical aspects of my relationship with religion and my sense of trying to incorporate the full spectrum of what I feel, that is the extremity of my emotions and my mental state, which in some respects in the past might have been a little bit embarrassing to reveal the depths of. I had a hesitation to be either too overtly religious or to criticize religion too overtly, or some kind of a feeling that I needed to present some kind of an internally consistent worldview that I’m then giving to people. Basically, I abandoned that with the last album, Ten Stories, but I also made the different worldviews different characters. This time around, I tried to own up to the depths of my dissatisfaction with religion, but also the depths of my love for religion. It’s kind of inconsistent internally, just in that one respect at least, but also I didn’t need to make different animals voicing these different perspectives. I could just say, “Yeah, that’s all how I feel.” It’s not clear and it’s not coherent, but it’s all in there. There’s that and then there’s the four-letter words, some language that I have kept edited out in the past. I don’t like to curse a lot, but it’s there. I didn’t want to not put it on an album just because I thought maybe they won’t sell it at a Christian bookstore or something. That’s no reason to change what you’re creating. You’ve also talked a little about this album being about catastrophe, and there’s apocalyptic imagery on a lot of the songs. What about those kinds of things resonated with you to wanting to write so much about them? Maybe that ties in with my previous answer in trying to own up to the full scope of what I feel or what I see in the world or in my faith. In the past, for example, I’ve tried to write a lot about love and God’s mercy and forgiveness and kindness. I’ve tried to be more of a positive force. In all the major religions I’m familiar with, that kind of sentiment is there, but there’s also this sentiment of justice and destruction and power and the end of things. There’s the creation and there’s love, but there’s also destruction and judgment. I don’t know what those things are, but they’re concepts that are floating around in my brain. Our society is well aware of this idea that the world is going to end. We all know that we’re going to die. We all know that there’s violence and horrible suffering. I didn’t think it was honest to keep on writing about positive things and happy things, not that that’s all I did, but I did try and steer the ship in that direction so that the final message was overall an uplifting one. I actually still think that’s the case, and I still do want someone listening to our new songs to be on the whole uplifted, but I don’t know that I have the capacity to do that. In this newest batch of songs, I don’t so much try to force someone’s feelings to be positive. I try to leave more ambiguity and more room for interpretation and uncertainty. Would you say, then, talking about end times and such, that most of the themes were derived from the Bible, or did you also pull from other sources as well? Yeah, I’d say the Bible is a big one, but there’s all kinds of sources. Whatever I’ve been reading in recent years is bound to make its way into how I write. Specifically, I was reading James Joyce a lot before the album, to some extent to try and help me feel less inhibited and let go and write whatever was inside and not be afraid of the consequences. I’d say he was a big influence this time around, and then all the old writers that I’ve been drawing from for years, like Rumi and Thomas Merton. These guys are spiritual authors, I guess you could say, but they’re not all drawing from the Bible, nor was I by any means. There’s just so much from the Bible that has so much vivid imagery and so much that’s a part of my psyche. I’m sure there will never be any getting around that, but this is probably the most deliberately Biblical record we’ve made. Well, maybe when I look at it I’m just trying to round out some of the other ideas I’ve taken from the Bible of some of the more uplifting messages. This time I tried to take some of the darker images of the Bible and come to terms with them in my own little way. The first song you released off the record was “Red Cow,” which has that classic mewithoutYou sound to it and also pulls in references from the Old Testament and Moses. What about that song stood out to you that made you want to release it first? That wasn’t my decision. That was somewhere between our manger and our label thinking this song is going to best represent the album and strong enough to get people excited about the rest of the songs. I like it as a single, or whatever we call that. We did a music video for it, and we’re working on editing that now. I think it’s a good representation of where we are now, but it wasn’t my decision to push it. What went into writing that song? Musically, I was pretty disconnected from the writing, as I was with most of these new songs. I wasn’t around for a lot of it. I wasn’t at most of the practices, so the music came together in ways that I can’t speak on. As for my contribution, it wasn’t too different than any other song. This time around with writing I tried to avoid having a single theme that ran across the entire album, simply because I didn’t want to repeat the last approach. I also didn’t want it to be a total hodgepodge of nonrelated content, which is what some of our earlier albums were. I tried to split the difference, where I picked a few different themes and separated them. I wrote a bunch of content under each theme, and then mixed and matched content from each of those themes to make different songs. There’s probably five to 10 different themes on the album, several of which show up in each song. In that case one of the themes was, as you noticed, Old Testament, Moses, and some of the stories of the Hebrew people. That’s partly my heritage, religiously, so I’m examining both what that says in terms of the text and how that feels culturally for me as a Jew and also as somebody who doesn’t totally identify as Jewish. That’s a part of who I am, so I feel like it’s worth writing about. Then there’s other parts of the song that are more explicitly describing my honeymoon, which was about a year ago now that I got married. So there are different sections of the song that address totally different parts of my life, and I like it that way. It keeps any one song from feeling too disconnected from the rest of the album. To me, it helps to tie that song in with, say, the third track on the record, which also addresses our honeymoon but doesn’t talk anything about Judaism. It also ties in with the last song on the album, which addresses Judaism but maybe not so much the honeymoon. You get what I mean? It has several themes going through it, each of which relate to other songs on the album in different ways. That third song, “D-Minor,” that you were talking about is a sequel to “C-Minor” from Brother, Sister. That’s one of the things you’ve always done on albums, various sequels to past songs. What about that makes it something you keep coming back to by trying to expound on past ideas? That has a pretty humble beginning, that strategy of mine. I’m a big fan of Neutral Milk Hotel, who did sequels to some of their songs on one of their albums. It was during our second album, Catch for Us the Foxes, with the song that ended up being called “Four Letter Word (Pt. Two).” I had the whole song written, basically, but I had trouble coming up with a first line. I just thought, why don’t I take a line from a previous song we’ve written, which was called “Four Word Letter,” and I’ll reuse it? That way it’ll tie into the previous album, and I liked the lyrics. So to me it is a way of keeping some kind of consistency across the years, and also just in a very basic way help me out when I’m having trouble coming up with an opening lyric. That’s the hardest part for me usually when I’m writing a song, is coming up with the first line. So between that song, or “Nice and Blue” and “Nice and Blue (Pt. Two),” or “Bullet to Binary (Pt. Two),” there are these times where I took an opening line from a previous song that I liked and it made the whole process easier for me. It helps me think about that song again, kind of like what I was saying on one of the previous questions in some respects. It helps me think about that song in a new way that’s distinct from a previous release, but also ties in with some kind of continuity. Another thing I thought was a cool touch is on the song “Watermelon Ascot,” where you sing parts from the old hymn “Leaning on the Everlasting Arms.” Where did that idea come from? There’s quite a bit from old hymns on this album. On that part I was trying to come up with a melody for that ending, and I had that song in my head. I started singing the lyrics to that song to the melody that I had, which actually was pretty close to the melody to that hymn. I took the hymn and tweaked the melody a little bit just to have a filler. I wanted to have something to sing, so I could see if this idea was going to work melodically with what the music is doing here. So I tracked it just really in an offhand way. I literally went through it maybe once or twice, just as a scratch track, and ended up liking it. Will, our producer, put a bunch of cool effects on it and made it sit in the mix really nicely. Then I thought, “Well, it ain’t broke. Why fix it?” So I ended up keeping it. It actually was never intended to be the lyric to that end part, but I thought it worked well enough. I had other things to take care of, so I left it as is. You mentioned wanting to have at least some small measure of hope on the record. The last song, “Rainbow Signs,” expresses some of that, which is obviously also a reference to Noah and the flood. Can you talk about what it was like creating that song and what you wanted to end the album on? That’s a good question. The original ending of the song was that big heavy part that ends with this feeling of Judgment Day, Armageddon and Riders of the Apocalypse imagery, the Revelation imagery, and then I tried to imagine what happens after that in just a few lines. It’s not very thorough, that was my intention, but it didn’t sit well with me. The song ended with this big crash and feedback, and on this note of the Judgment Day and what happens after Judgment Day. It really rubbed me the wrong way. I was very sensitive to how this album ends, as I typically am. It almost doesn’t matter what you say on the whole album if you end it on a sour or down note. It aggregates everything that was said previously. It trumps all that, and you’re ending on a sad note. Or on the contrary, if you say all this really sad stuff and then you end on a hopeful note, in a sense you’re transcending all that sorrow with the hope. In this case, I didn’t feel happy ending on this Armageddon, judgment of God note, but I also didn’t feel qualified to try to speak anything more on the love of God, or hope of heaven or resurrection. Anything that was universally more hopeful. The only thing that felt right was to start singing about my dad and a personal joke I had with him. To me, it’s a very intimate and very personal moment that is the most open I’ve ever felt on an album, but in a way that nobody else is going to understand. Not even my wife will understand. My dad died a couple years ago and he’s the only person that would get what I’m saying, so in a sense it’s like an ending for nobody at all. It was just me and my dad, and that felt like something I was qualified to write about. A lot of this other stuff, writing about God, or love or judgment, it feels pretty deeply out of my league, pretty thoroughly a point of absolute ignorance for me. To try and write about God and say anything seems almost preposterous at this point, as if I speak from a point of knowledge. Of course I can share my experiences and my faith, but I can’t tell people what’s true when I don’t know what’s true. But I can sing about my relationship with my dad with some conviction and some sense of knowledge, because it’s not a thing that I know, like a proposition or a fact. It’s just a relationship that I experienced and I still experience. So there was something a little bit more appropriate to me about closing the album with that sentiment. There’s a few references to Idaho on the album as well and I was curious if there’s any significance behind that. My wife is from there. That’s where we got married and that’s where her family mostly lives. Gotcha, that makes sense. So you’re releasing a deluxe edition of the album that also comes with a bonus disc. What all is included on that bonus disc? That was sort of an afterthought that kept growing and growing. We had a few extra tracks that we had recorded, but they were finished to all different extents. One of them we finished the song completely. Another track was finished instrumentally but had no vocals. Other tracks we had recorded demo versions of but never recorded in the studio where we did the rest of the material. So basically we had a handful of tracks that were interesting enough we thought people might want to hear, but they weren’t fully fleshed out. As we started to flesh them out, we realized, “Well, why don’t we try a few other things?” So we started to track different versions of songs. A few of the guys took it upon themselves to write a different arrangement to a few of the songs. There’s a whole wide array of types of songs on there, ranging from full on b-sides that didn’t make the cut from the studio sessions, all the way to basement demos that we never recorded in any high fidelity way, all the way to tracks that we wrote specifically for this extra disc. It’s just a thrown together mix of all these extra tracks and experiments that we tried. I don’t know how it all fits together, I haven’t even heard it all as a fully mastered release or index, but it was interesting to at least try something different. The last record, Ten Stories, you put out independently, and then with this one you’re back on a label, Run for Cover Records. What went into that decision of going back to a label instead of putting it out yourself again? That was more the other guys in the band. I didn’t have very strong feelings about that. I just don’t know much about the business side of what labels do and how much work it is to put out a record without having a label, which is basically what our manager did last time with Ten Stories. We started our own label, but in a sense that really meant our management did all the work that a label usually does. In this case, I think it was partly to lighten our manger’s load and also to partly team up with a younger label that has tapped into a whole world and a whole scene that maybe we are out of touch with or we don’t know. We have all gotten older, but there’s still younger people that are wanting to hear our style of music or maybe haven’t heard of us that maybe Run for Cover is in touch with. It felt like a good way to have somebody else on our side that we could collaborate with and bounce our ideas off of. We were still given control over what the songs sound like. We wrote and recorded all the music before signing with Run for Cover. It was actually really nice because we got to bring them a finished product and ask them if they wanted to be a part of this, rather than asking them to take a risk. Do you want to give us a bunch of money to go record, and you might like it or you might not? In this case, they could see the product before deciding whether to invest in it. So I have a handful of questions now that some of the users from the site submitted. The first one someone wanted to know if you are a fan of La Dispute, being that they are also one of the few bands out there that incorporates a spoken word element. Honestly, I don’t know their music. I’m so out of touch with music that has come out in the past 10 years. It’s certainly nothing against them. I’ve met one or two of the guys and they were super nice. I have heard a little bit and it seemed pretty interesting, in terms of just what you were saying. It kind of has that spoken word kind of approach. I’ve actually moved away from that style in some ways. Not completely, but I think it’s nice how that style of vocal delivery really makes you pay so much more attention to what’s being said. When someone’s singing, like in a lot of pop music, you can’t even necessarily understand what the lyrics are, which has its ups and downs. Maybe you don’t want to hear lyrical content, you just want to hear a vocal sound, in which case you could listen to Sacred Harp or someone singing in a language you don’t understand or in a way you can’t understand them. With a band like La Dispute, from what I’ve heard of them, the content of the lyrics is very up front. The lack of melody is jarring in a sense, so you can’t just tune it out and let the words blend in with the what music is doing. It becomes another instrument. It’s very much a human voice, so that’s something different. It’s certainly not for everybody, but obviously I like it enough to do something like that to some extent. I also like melodies, and I try to incorporate some of that as well. I had another question about what has been your experience going to school and doing the whole PhD thing. Well, I’m still writing it. I’ve finished all my courses, but I’m in the thick of my dissertation as we speak. Not literally right now, but for the past couple of months that’s been the main thing on my plate. I did that pretty intensely for a solid year, then I stopped to write and record this latest album, and then I returned back to the dissertation. That was challenging because I actually requested of the band if we could wait until I’m done with my dissertation before we start writing another album, but they didn’t [laughs]. They wrote all the music and there it was, done and waiting for vocals, so I felt like I had to oblige them. I didn’t feel like I was totally ready to write this album, but I also didn’t want to keep everybody waiting. It was hard to put writing the dissertation on hold, get in a whole different headspace of writing songs, and now trying to go back to all the research I was doing. My brain feels really rusty in that department. I spent a year researching at an Islamic private school, spending time with the teachers and administrators and talking with students. I’ve been looking at different interpretations of Islam and different understandings of Islam among the community members. And that place was locally there in Philly? You know what? Believe it or not, I probably can’t say. There’s some degree of anonymity involved in doing this kind of research. I’m writing about real teachers and real people at the school. I told them I’d protect their privacy and everything. Basically all I’m saying in the paper is I spent a year at an Islamic private school in a medium-sized city in the northeastern United States. There’s not many Islamic schools in Philly or in Baltimore, you know what I mean? If someone knows the city, they can probably identify what school I was going to and know that’s the principal there. He said that. Someone else wanted to know how being a professional musician has changed your life, either for the better or for the worse. Oh, that’s a huge question. I don’t know. I can tell you smaller things, like the day in and day out of being in a band. There’s times where I get very burned out on social interactions, like I’ve become more introverted over the years. I don’t know if that’s because of what I do. When I go on tour, I end up interacting with so many people day after day. They’re people I don’t know, and I have a hard time learning very much about in the limited time that we have. I have a hard time feeling very connected with people I just meet sometimes, so it’s made me appreciate being alone or being with people who I’m more familiar with. I’m eager to have a small community I can feel more comfortable with. At the same time, I appreciate the challenge of trying to connect with people that I’ve just met and try to find a place that we can relate and a way to understand each other, care about each other, and treat each other with respect as human beings. That’s cool, too. There’s all this other stuff that comes with me being in this band, like totally superficial ego stuff. I probably have become more arrogant and more pretentious, and I take myself more seriously because more people have paid attention to me as a musician than they ever did when I was the manager of a dollar store in high school. That makes me feel like this sense of importance is probably inflated. I think it probably has all kinds of harmful effects on my sense of self-importance. Someone remembers around the time It’s All Crazy! came out you were saying how you wanted to move away from shouting on record and onstage. Why did you decide to reincorporate that? Basically, I tried to do what was appropriate for each song. Not to come in with this game plan, saying, “Well, I’m going to sing the whole time. I’m not going to shout.” Or saying, “Well, I’m going to shout just like the good old days.” No, I don’t want to have some prefabricated strategy. It seemed better to me to wait until the songs were written and see what did they call for. In this case, there were parts that called for singing and parts that called for shouting. Parts that felt like they called for totally letting it rip and screaming as heavily as I could. The fact that the new album incorporates all those, and a little bit of spoken style, I tried to blend them together in a little bit more of a seamless fashion so it wasn’t like we had all these heavy songs and then here’s a soft song. On any song where I’m screaming or shouting, there’s going to be some melody. Most songs if I’m singing melody, there’s going to be some shouting, too. Each part hopefully blends together with the next in a way that’s deliberately tailored in a unique way to that song, but still with the intention to tie it into the album as a whole and not just throw everything in but the kitchen sink. I’m still trying to keep it familiar with what we do and who we are as a band, but push ourselves in a little bit of a direction towards what we do best. I had someone interested in philosophy and theology ask if you had any recommendations as must reads on those topics. No, there’s not anything I would recommend and I’ll tell you why. I don’t know who’s asking that question and I don’t know who would be reading this. With that in mind, I wouldn’t want to say, “Here, read book X from author Y.” Then everybody who reads this thinks I’m endorsing that book for them. It might be that book wouldn’t be helpful at all to that person. It could even drag them down. I don’t know what anybody else needs to read. I do feel like definitely a lot of things I’ve been reading over the past few years have helped me untangle a lot of mental knot work, but I would not go so far as to recommend those things to someone else. As you’ve alluded to earlier, you have a love/hate relationship with religion. Where do you fall on the spectrum currently? I can tell you this, I’ve come to put less stock in what I say I believe. I feel like my affinity for whatever religious group or set of ideas is more provisional or relatively superficial than I might have previously thought. Let me give you an example. When I met the woman who is now my wife, I went to her hometown and met a whole host of her friends and family. In some ways I felt very accepted, in other ways I did not. Certain people had certain religious beliefs and wanted me to have those similar kinds of beliefs in order to be accepted into their community fully. I felt kind of rejected and I felt hurt. It made me sort of lash out inwardly towards this religion as a whole. It made me resent this religion, because it made me feel personally not accepted by people that I wanted to accept me. Now, that was just a kneejerk kind of emotional reaction. I don’t stand by it, but that’s how I felt. I have since come to reconcile with those feelings, and reconcile with those people and feel good about where we’re at. I bring it up for this reason – I think my relationship with religion is largely made up of those kinds of interactions and those kinds of considerations, relatively haphazard, selfish, emotional and superficial. They’re untrustworthy. It doesn’t say anything about the truth of Christianity. It may happen to make somebody feel good, or may happen to make somebody feel sad or rejected. This is all to say nothing of the fact that Christianity as a religion, much less the concept of religion in general – these concepts are so hard to pin down, so broad and so abstract. For me, they’re so difficult to define there’s no way I can even address what it is I have a love/hate relationship with. There’s not any one thing called religion or any one thing called Christianity, or even any one thing called Quakerism or Sufism. No matter how specific you get in a worldview, there’s still these abstractions that are going to take on totally different meanings for the people that approach them. So I get more reluctant to talk about these things in any kind of universal way, like, well, this is what I think about religion. It’s the opiate of the masses, like Marx said. Is Christianity the true account of humanity’s relationship with the Divine? Is it? I just don’t know what these words are even referring to, necessarily. Believe it or not, I’m reluctant to speak about it, even though I’ve been rambling for the past 10 minutes about it. That’s only from me trying to say I don’t have anything very solid to say because they seem like very slippery concepts, you know what I mean? Yeah, I totally get where you’re coming from. So after this summer tour, where do you see mewithoutYou heading? Do you foresee next year doing anything special for Brother, Sister’s 10th anniversary? Well, I don’t know. I hate to be so evasive with these questions. My world has just become so very immediate. I have so much on my plate today and in the upcoming couple of months, just with this tour alone and being newly married and all this stuff with my dissertation. With this upcoming tour that we have, it’s hard for me to think much beyond that. I try to trust that the chips will fall where they may and I’ll make the best of it. I can’t say I live in the moment or anything like that, because there’s certainly plenty else in my mind that’s not right here immediately, but I try not to think too far ahead. Watch the new video from mewithoutYou. Drew Beringer tackles the latest masterpiece from mewithoutYou, the taxing yet rewarding [Untitled]. mewithoutYou's new album is now available. 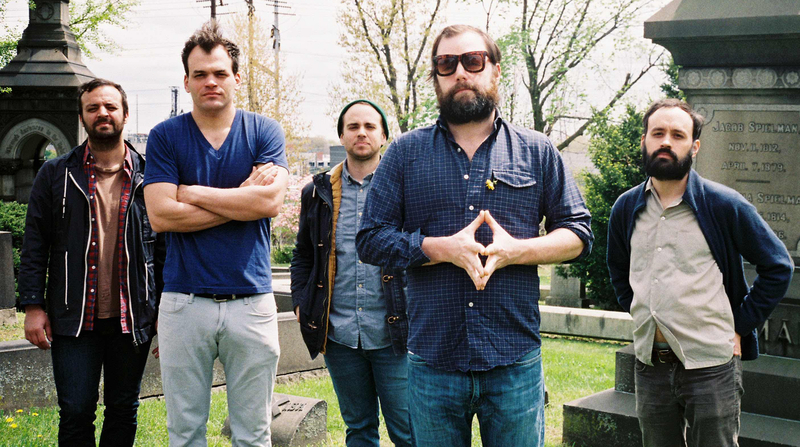 mewithoutYou debut a new song.